With the right timing, a band’s first live album can be both a reward and a point of discovery. Formed in Philadelphia in 1999, Dr. Dog’s ascent has been nothing if not steady, the decade since the band’s Park the Van debut Easy Beat claiming fans one by one, mostly through hearsay surrounding the live show. As each pass around the country reliably packed larger and larger-still rooms, the band began connecting with home-recorded albums—off-kilter, lo-fi, yet packed with quirky personality and magnetic pop hooks. So after seven albums, Dr. Dog’s first live record arrives, giving fans a memento of the band’s electrifying show and newbies 19 songs recorded at peak performance. Live at a Flamingo Hotel is a thoroughly impressive display of versatile rock ‘n’ roll showmanship, impeccable vocal harmonies and that thrilling edge of a band that got up and truly nailed everything that night. 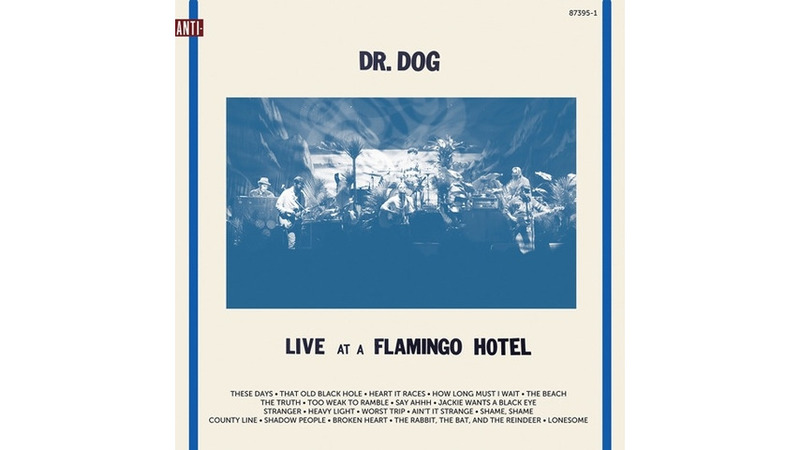 Sequenced as a show, Live at a Flamingo Hotel finds Dr. Dog shifting between six different albums, though 12 of the 19 songs come from the band’s three releases for Anti- Records, Shame, Shame (2010), Be the Void (2012) and B-Room(2013). Toby Leaman and Scott McMicken swap lead vocals almost song by song, but what’s more evident here than on studio recordings is just how much strength Dr. Dog draws from the back-up and harmony vocals on every song. The “show” kicks off with Leaman’s “These Days” and McMicken’s “That Old Black Hole” and immediately it’s clear that Live at a Flamingo Hotel captures the band’s easy-going excitability, psychedelic leanings and weird undercurrents better than any of Dr. Dog’s studio albums. Next up is the non-album track “Heart It Races,” an Architecture in Helsinki cover that Dr. Dog has given a characteristically joyous transformation into a live fan favorite. The curveball of the album comes on “Say Ahhh,” reaching back to Dr. Dog’s self-released 2002 debut Toothbrush. Revisiting the original is a trip—not only does this new keyboard-heavy bit of slinky rock sound vastly different, but it’s hard to imagine that fledgling band finding the trajectory that it did. The strongest crowd sing-along portion of the record comes with the deceptively uplifting “Jackie Wants a Black Eye,” a “lonely together” ballad that looks for strength in shared misery. A standout from Shame, Shame, the song is an easy vehicle for understanding the pull of Dr. Dog: honest, unconventional yet relatable songwriting, pushed along by a warm and buoyant melody, perfect for whether you’re madly in love, madly insane, or can’t tell either way. Two We All Belong cuts—“Worst Trip” and “Ain’t It Strange”—get updated with fuller sounding versions, showing a bit of the evolution of Dr. Dog’s own strange trip into becoming rock ‘n’ roll heavyweights on the stage. Another crowd favorite—“Shadow People”—forms the emotional peak of Live at a Flamingo Hotel. Blossoming from an acoustic guitar to the full-spectrum Dr. Dog sound, it’s a celebration of those nights when going against the grain somehow goes just right. “The right night for the wrong company,” indeed. For those who have witnessed the joyousness of a Dr. Dog set—especially since the release of B-Room in late 2013—this is an impeccably recorded stand-in for that experience. Like Wilco’s Kicking Television and My Morning Jacket’s Okonokos, Live at a Flamingo Hotel is an indie-rock live album that reaches back to the great standard-bearers of classic rock live albums. Live at a Flamingo Hotel is a pristine concert documentary, brimming with the energy, charm and consummately great sound of all those Dr. Dog shows that have hooked so many new fans over the years.